Four Island is the smallest area you can explore at the Sevii Islands, as there are no roads to explore. Despite this, Four Island still manages to hold great surprises for you. The famous Icefall Cave is here, northwest of the town. 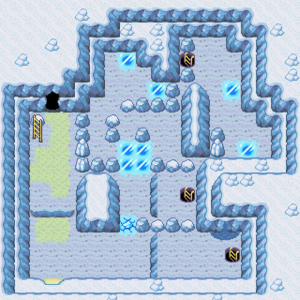 The villagers inform you that this is Lorelei's hometown, but that she went inside Icefall Cave. Once you are done exploring the town, Surf inside the cave and try to find Lorelei. The south house is home to a Braggart, who will award you stickers to put in your Trainer Card according to what accomplishments you've achieved in the game. He will award you a sticker for: (1) beating the Elite Four; (2) hatching Pokemon Eggs; or (3) winning Link battles. You'll get a sticker the first time you accomplish any one of these, but earning further stickers is not recommended, as it requires you to repeat these accomplishments dozens of times. 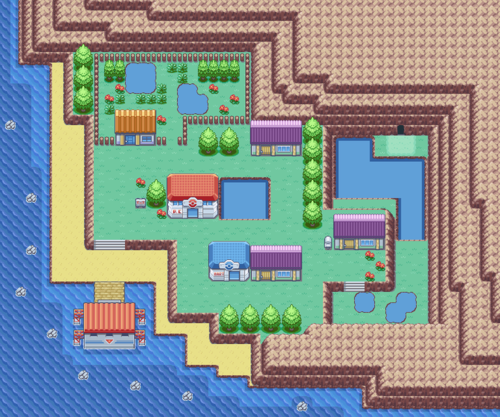 A Move Tutor lives in one of the houses here, and will offer to teach your Pokemon Body Slam. In addition, Lorelei's home is also here. Her collection of Poke Dolls just keeps growing, and is worth a look. If you explore the island a bit, you'll find a Star Piece behind a breakable rock, and a Stardust just south of the cave. In addition, the beach also has a hidden Ultra Ball and a hidden Pearl. North of the town lies the Daycare Center. While this Daycare Center will also level up your Pokemon, like the Kanto version, this Daycare has an important additional function. The Daycare center will allow you to store two Pokemon at the same time, and thus, under the right circumstances it may just be possible your Pokemon may mate and create a Pokemon Egg!!! Check the Breeding page for more information on this optional, but rewarding, side project. 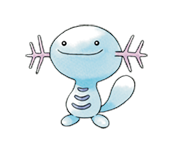 Wooper is a Water/Ground Pokemon exclusive to Fire Red. Wooper's learnset is decent, sporting moves such as Water Gun, Mud Shot and eventually Earthquake. Once it evolves into Quagsire at Level 20, its stats grow to be quite balanced, only lacking in speed. Unfortunately, while its attack is pretty good (good news for its Ground moves), its Spc. Atk is nothing to get excited about, so it remains outclassed by Pokemon such as Blastoise or Lapras. Marill is a Water Pokemon exclusive to Leaf Green. Marril's learnset is filled with great moves, including such as Double Edge, Rain Dance and eventually Hydro Pump. Marill evolves into Azumarill at Level 18, increasing its HP, defensive and Spc. Def. stats to above average levels. Despite holding strong moves, Marill and Azumarill's stats are instead much more appropriate to stalling than outright battling. They are quite cute though. Once you're in Icefall Cave, surf across the water and go deeper. Ignore the waterfall for now, you'll be climbing it soon. 1. 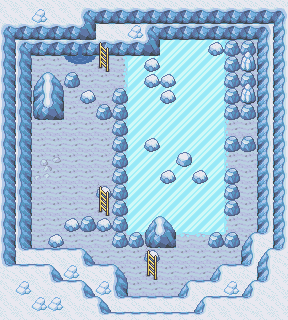 Go past the initial ice tile, and walk on the tiles in the right to reach the Ultra Ball. 2. Walk over to the north area, and fall from the northernmost tile. 3. Climb up the stairs and then fall from the nearest tile to the stairs. 4. Skate down and right to reach the Nevermeltice, then skate left and up, and climb the stairs again. 5. This time, fall from the farthest tile to the stairs. 6. Skate up, right, down, left and down to reach the next set of stairs, but don't forget to claim the Full Restore before you climb. 7. Get the HM 07 Waterfall !!! 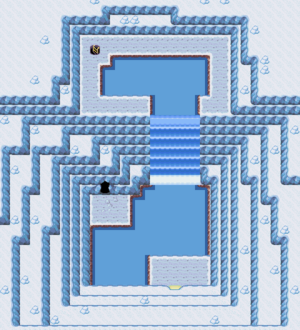 After getting the HM, teach it to a Pokémon, go back to the entrance and go up the Waterfall, then climb the stairs to reach the next cave. You'll find Lorelei defending the Pokémon of this cave from Team Rocket. She'll then drag you into the argument, and you'll have to fight one of the Rocket Members. Stay around a while if you wish. 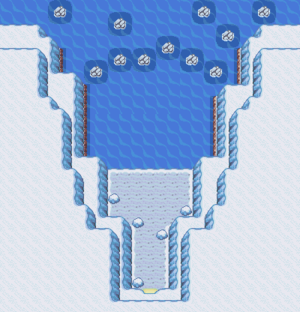 This cave is very well known to be the only place where Lapras may be caught in the wild, so if you haven't been raising the one gifted to you back in Silph Co., this is the perfect chance to start. The cute piggy Swinub is a Ground/Ice Pokemon that has pitiful stats, but once evolved into Piloswine at Level 33, he'll gain a good boost to its HP, Attack and Defense stats. His learnset contains no Ground moves, but will eventually learn Powder Snow, Take Down and even Blizzard! It's also capable of learning some good TM's. Unfortunately, while Piloswine may serve well as a thick wall, and can attack well if you teach it some Ground TM's, its Spc. Atk. is not too great, so it will not work in the Ice department as well as a Lapras or Cloyster. Delibird, exclusive to Fire Red, is quite the strange bird. It's only move is Present, which attacks with random power, and has even a chance to heal your opponent! Delibird is quite able to learn some good TM's to supplement its pitiful moveset, such as Ice Beam or Fly. However, its stats are lackluster at best, so it will probably not replace either your Flying or Ice members in your team any time soon. Sneasel, exclusive to Leaf Green, is a Dark/Ice Pokemon that is particularly speedy, and with good attack stats. It does look pretty cool too. Its learnset includes attacks such as Slash, Faint Attack and Icy Wind, and can supplement its moves with a great variety of TM's. Unfortunately, while Sneasel is the first Dark Pokemon you've encountered, it will not work well either as a Dark or an Ice Pokemon, as its Spc. Atk. is beyond pitiful. Best leave Sneasel in your PC. The Rocket Warehouse requires two passwords, and you only have one from eavesdropping on two previous Rockets at Mt. Ember. This page was last edited on 1 July 2017, at 17:38. This page has been accessed 289,140 times.